Terrace (1963) researched errorless learning with a successive discrimination task. In the traditional successive discrimination procedure (different than Terrace’s procedure), a pigeon, for example, is reinforced with food for pecking a disk on the wall of an operant chamber (called a key light or key) when it’s illuminated red. After many repetitions, when the pecking behavior in the presence of the red key is well established the color of the key changes to green and pecking is no longer reinforced. With the standard protocol then, the red light is the discriminative stimulus (SD) that cues pecking for food reinforcement, and the green light is the stimulus delta (S ∆) that signals the extinction condition, i.e., pecking will not produce food reinforcement. The red and green keys are then alternately presented with the corresponding reinforcement and extinction conditions in effect. After initially making many errors (due to response generalization), the correct differential response to key color gradually occurs (Pierce & Cheney, 2013). Alternatively, Terrace used two procedures in his errorless discrimination training not typical of standard discrimination training. 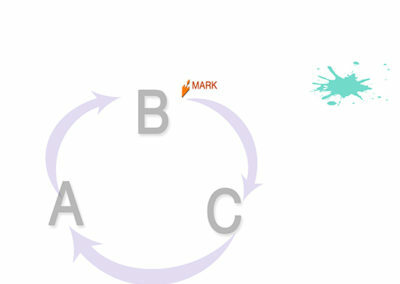 First, the S ∆ condition, the green key, was introduced very early in the program before pecking in the redlight condition was well established. Second, Terrace used a fading (i.e., fading in) procedure to present the green key at different values, gradually increasing brightness, wavelength and duration over the repetitions. These two procedures resulted in faster learning of the discrimination and very few errors. The pigeons trained with the errorless discrimination procedures made about 25 errors (i.e., pecking the green key light) compared to 2000 to 5000 errors made by the pigeons taught with standard procedures. Only those birds trained with T&E exhibited emotional responses in the presence of the S ∆. The pigeons trained with the errorless approach remained calm until the red disk, the SD, appeared. These findings have been widely replicated across species. Powers, Cheney, & Agostino (1970) found that preschool children taught a color discrimination with errorless learning procedures learned faster and with fewer errors, and they enjoyed learning more than the children taught with standard procedures. Roth reported similar results with dolphins (as cited in Pierce & Cheney, 2013). With this mindset underpinning the training, adding reinforcement to correct choices does not make it positive learning. Any time being wrong is deliberately included in the curriculum we are failing our learners. Sure, learning may be effective, unforgotten and lifelong but at a cost. The cost can be a mistrust in the teacher. When the learner is faced with a new lesson they may first ask “what is the trap?” This is a negative view and likely to cause hesitation and a resistance to discovery and exploration. If you think your teacher is only setting you up for success you approach with an enthusiasm and eagerness for the learning. All of us have been damaged by the error-trap. Whether it was deliberate on part of the teacher or not, it makes us cautious learners. In addition to this approach to learning we then experience frustration, that can escalate to rage, when we cannot solve the error. If you have ever used a computer connected to a printer you have experienced this. And it wasn’t good. This is an elegant process that builds on success and teaches exquisite discrimination skills. When a stimulus is presented it is rarely in isolation. Reality surrounds our stimulus with relevant and non-relevant information. We cue a behaviour verbally the way we are standing can either support that information our contradict it. A step towards the dog as we cue a “sit” can force the dog to take a step back: the step towards contradicts the verbal cue. When teaching a behaviour we want to surround the stimulus (which may be the temporary cue, not the final one) with an environment that encourages success, not error. Under these conditions an error is simply information that tells you the environment needs changing. The dog is responding to a selected cue that does not contribute to our goal. The step towards causing the dog to step back. It is always the dog that get to choose what is relevant and what information they are receiving. If I have food in my hand and I have used food to hand-lure behaviour, then a step towards food in the hand is a correct response for that dog. If you have taught a nose-touch to hand, then a hand cue that asks the dog to wait, hold position, is a mixed message. To be able to teach without confusion, frustration or error we need to be clear in our communication and understanding of what information the dog is taking from the environment. An error is simply the difference between my expectation and the dog’s response. it may tell me a change in the environment is a stress overload. 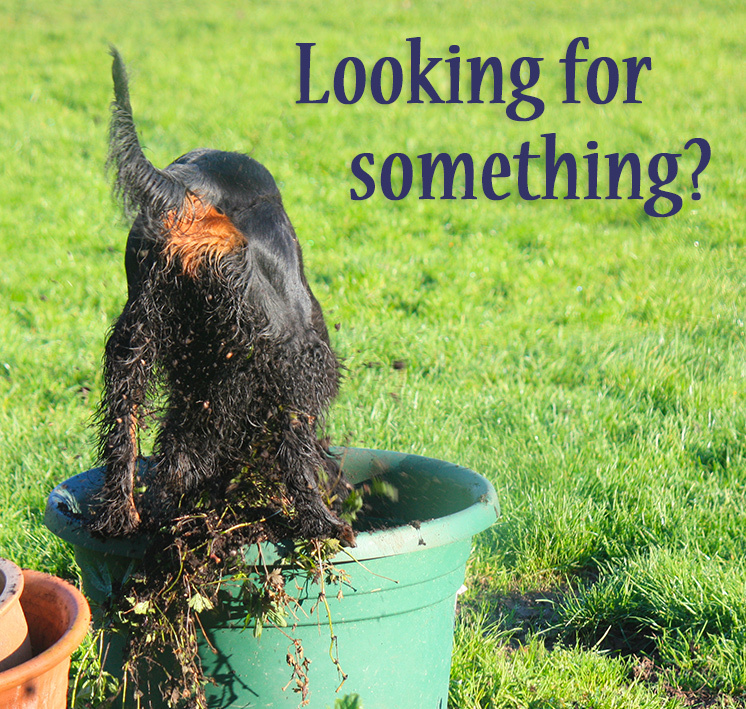 It could be too much information, a threat or opportunity the dog is struggling to resolve. Errors should be noted, and if possible logged with a clear description. The type of error, or response from the dog, can often give us important information, it should not be simply recorded as “error”. Before we begin the practical work we should prepare a range of events to fade-in. These are our green:blinks – the increasing brightness, wavelength and duration of the light in the Terrace experiment. They should be of short duration: a blink, of low intensity: quite far away, and have very little impact or relevance to the dog. Green:blinks should never be an event or something the dog wishes to avoid. We train with attractions, not aversions. If you have a training assistant they need to be fully aware of how to fade-in and when to fade-out. 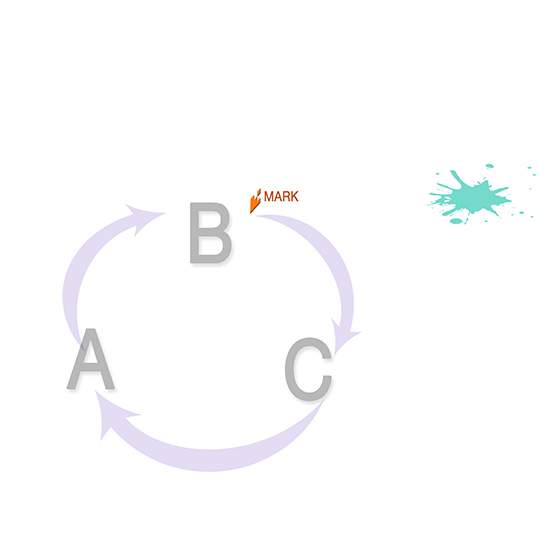 If you are training alone, use a fixed green:blink and as you progress through the repeats of the cycle you can control the exposure of the dog to the green:blink. You could use a pot of food on a chair outside the doorway. At first it is not on view, then on view for a moment, then increasingly in full view, then closer in proximity until the dog is rolling through their cycles alongside the chair. To begin the fade-in application we begin with the base behaviour. If it has been taught previously then it would benefit from refreshing. This is the behaviour the dog will default to when unable to make a choice. It is the red light in the Terrace experiment. 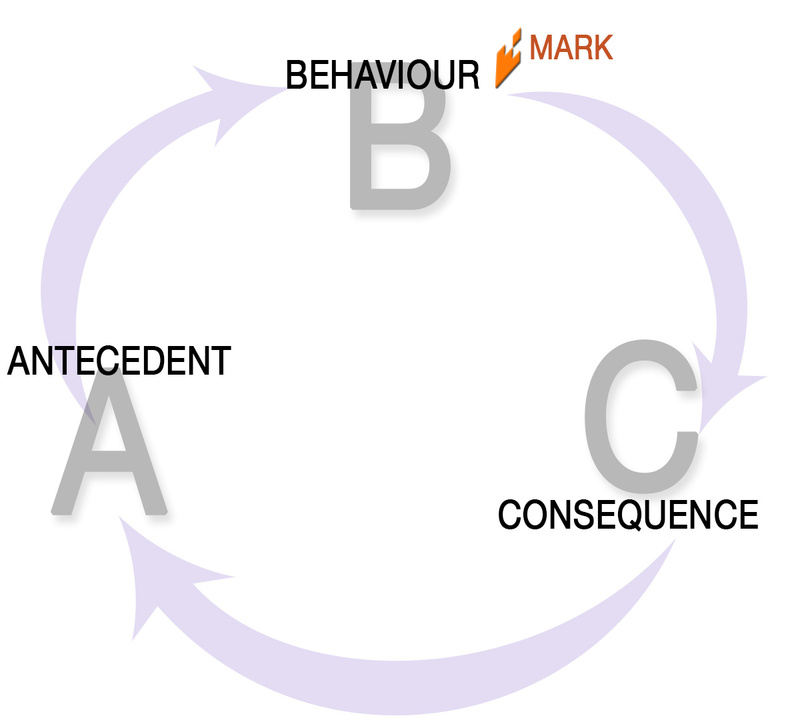 We choose this behaviour in the cycle of Antecedent, Behaviour [Mark], Consequence. [Mark] is optional. We look to see if the dog is ready and seeking a cue, we give the cue (A), the dog responds with (B), we mark this to promise good things and begin the reinforcement delivery process (C). As the dog consumes their treat they will be seeking another cue. More ..? After the dog has completed the behaviour, been marked and is seeking their reward, we begin to introduce the minimal green:blink. If it can be arranged it is a short “blink” between the mark and the collection of the food. Either as I reach, walk or open the pot, or the dog runs after a thrown treat or steps towards an offered treat. ~ The dog has been marked and in their experience this leads directly to much anticipated reinforcement. 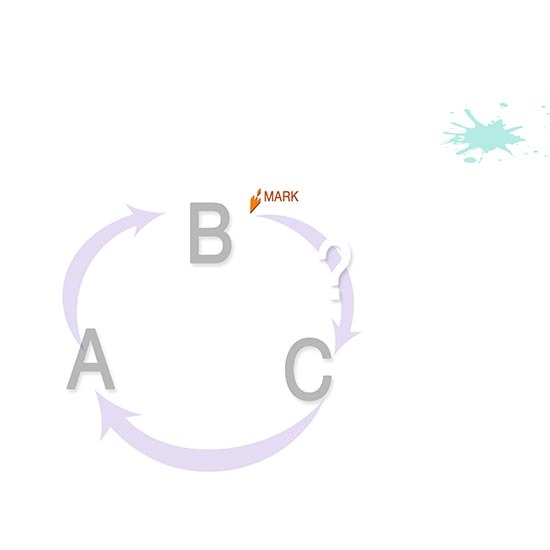 I suspect this is the strongest part of the ABC cycle. 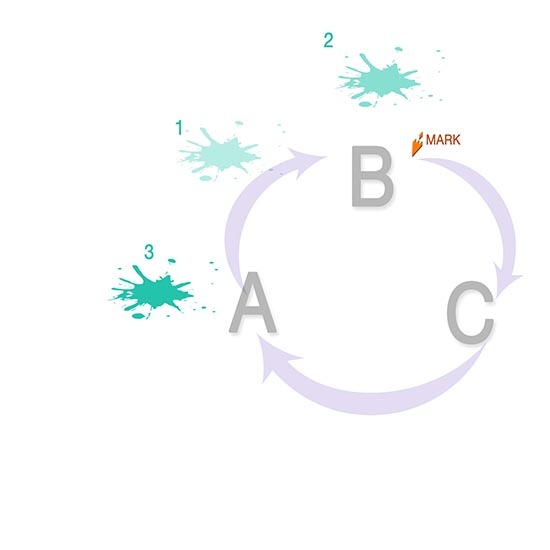 If at the moment of travelling to reinforcement the green:blink is of greater interest, then the only part of the cycle that has been interrupted is the collection of a treat. The dog has chosen green:blink as a preferred reinforcer. That is important information that may impact on my choice of reinforcer. ~ If the dog shows awareness of the green:blink and continues to consumption of their treat then there is a pairing beginning of green:blink and treats. ~ If the dog chooses to explore, investigate the green:blink, we should not regard this as an error and make an teeth sucking, sighs or noises. No error, just information. 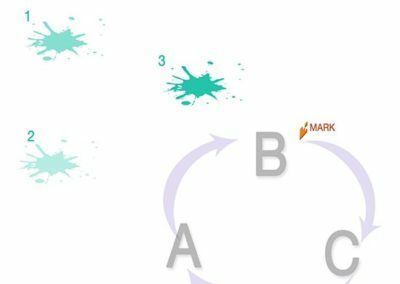 The dog still gets their treat and we change the green:blink – further away, for shorter duration AND increase the value of the reinforcer. We are not seeking to punish, just seeking information. If you look at the data you collect you may see that when a novel event arises the dog will look to it for a second or two, perhaps hesitate, process the information and make a choice to pursue the reinforcer you have offered. It is this process of assessment and choice that is the skill we want to teach, we want to let the dog learn how to make fast judgements about their options. I am tempted to call this a “WTF” moment, where the dog will look, and then continue the cycle. If the WTF breaks the focus on the cycle, then the fade-in has been too invasive. Adjust and proceed. This is the skill of living in an environment that is overflowing with many choices. 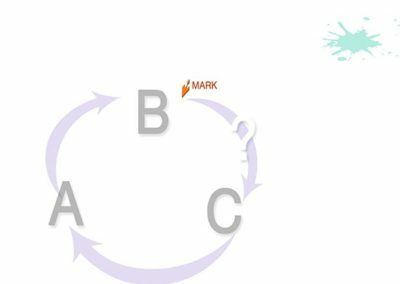 Once the fade-in has proven to not break the “C” part of the cycle in 6-10 alterations of intensity, we want to migrate the fade-in and WTF opportunity to earlier in the cycle. It is important that we keep the behaviour stable. Reinforcement is still occurring and if our green:blink has caused a wobble in the behaviour this will get reinforced. Dangerous ground. 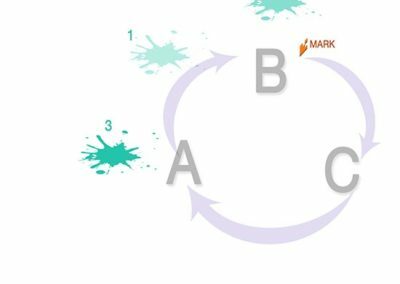 We should only progress to green:blinks during the behaviour (5) when green:blink has travelled many other places around the cycle and changed in intensity without causing hesitation. The delight in this process is many fold. Dogs generalise this very well. 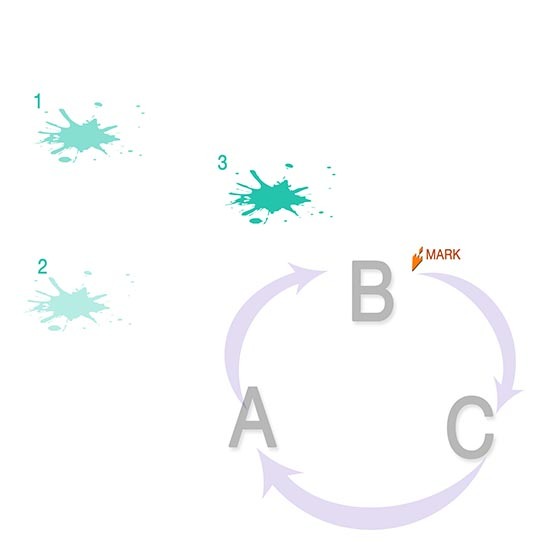 We can choose a cosmetic behaviour to teach it, not a life-important behaviour, and the dog will transfer the skills of maintaining the ABC cycle. Be careful not to label this process as “proofing”. We are not trying to test out the behaviour or the dog’s resilience. 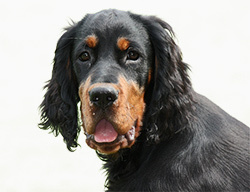 It is a teaching process that develops a dog’s capacity to focus on our training of cycles. 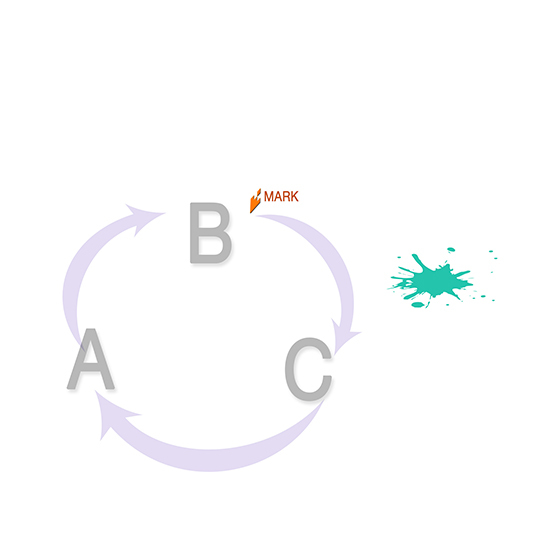 If a green:blink produces a reduction in the quality of that focus, we are setting up a permanent poor association that often gets reinforced (“because he sort of did it anyway”). You will have to find a way to laugh off the exceedingly long WTFs that may occur, plan for it and make sure you find a way of letting the dog know you screwed up and you would like to start again (after having sent green:blink packing). I use fading-in many, many times during every training session. We use it all day long if we look for it and your dog practices many WTFs – deciding that when you scratch your ear it is just a green:blink, that when the adverts roll on the TV, it is just a green:blink. These are non-relevant events that do not impact of their comfortable snooze, chewing of a bone, or deep hand-massage. It is a quite natural survival skills of assessing what information the dog should pay attention to under specific circumstances. 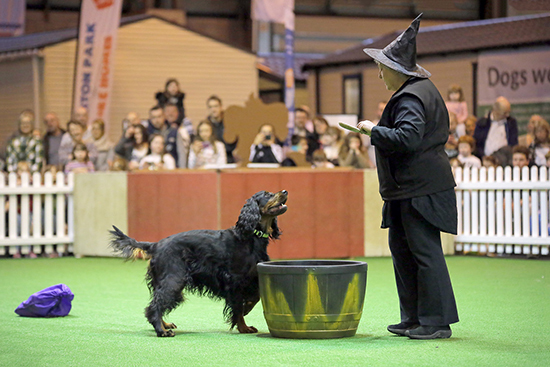 Often we need to dress-rehearse those circumstances to enable the dog to be confidence and fluent. There is a Forum for Seekers & Setters if you wish to share and explore further there is a forum for discussion ideas and share your fade-in protocols. Many thanks for this and very well timed. My pondering remained a WTF and did not escalate into a Leave It! Thanks Michaela, sometimes we don’t see the lines connecting the points until we wander around to a different view! This klog (I am learning to go with the new title) does go to the heart of how incredibly perceptive our learners are during the process. It’s our attentiveness to this that provides real learning and real leaps of understanding. 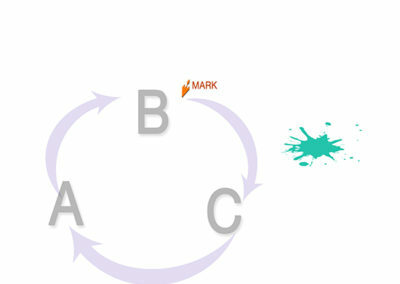 What I had missed is being attentive to “moving” the irrelevant stimulus into different sections of the learning cycle. For some reason I had attached myself to the “A” part. When in reality it’s all “part” of the fading in. It’s quite astounding when you consider “fading in” IS part of the learning process. It is strawberry season. Much anticipated (our version of the warm peaches direct from the tree). So if that strawberry, with some double cream is on the spoon and travelling to my mouth …… and the phone beeps ….. There is NO question, the strawberry goes in the mouth, then I decide whether to attend to the phone. But if I was just slicing the strawberries, I would most likely interrupt that moment to pick up the phone. What I love about this training is that the dog still has choice. We are not waving extra extra high value food or toys in front of his nose and using those to lure away from the “blink”. Rather the dog is allowed to look, to process and to decide “not relevant”. That way we can truly move at the dog’s pace. You are always thought provoking Kay!